Have you used /hoai to switch to the custom AI? Homun can't skill, already change AzzyAIconfig.exe nothing happen still not skill attack and buff to itself. Edited by ExMhiel, 30 March 2016 - 01:00 AM. ive recently mutated my amistr to dieter, however i noticed that it doesnt autocast amistr bulwark and bloodlust anymore. but my other low level amistr autocasts them just fine. any idea what should i do? 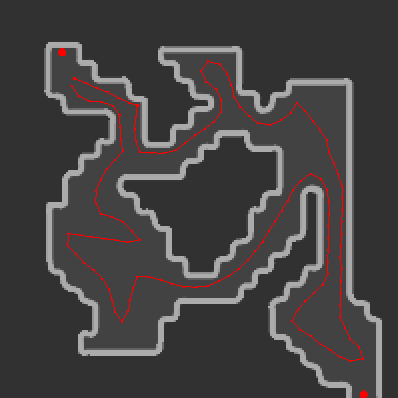 Been playing around with creating custom routes for mercenaries so my character can autofollow it around a map and I'm trying to set it up so that it follows a route around a map for mobs for my homunculus to kill. However, I'm having some trouble getting my merc to wait for my homun to kill the mobs on screen. On merc spawn it will wait but then it will just walk around regardless of whatever mobs are around. I have it set to tank all mobs in tactics. Anything else is on default. The route works correctly. My intention was for the merc to the tank setting to wait for the mobs to be killed by my homun rather than the actual tanking itself but it doesn't. It just runs off. For reference this is the route I'm using. Is there something I'm missing to make this work? I really can't figure out why my merc is ignoring mobs after the initial batch. are u still modifying the program or is that the final version? No matter what settings I use, mine will NOT attack ants in ant hell. Why? If the homun is attacking other monsters okay, then it's likely something to do with the tactics. 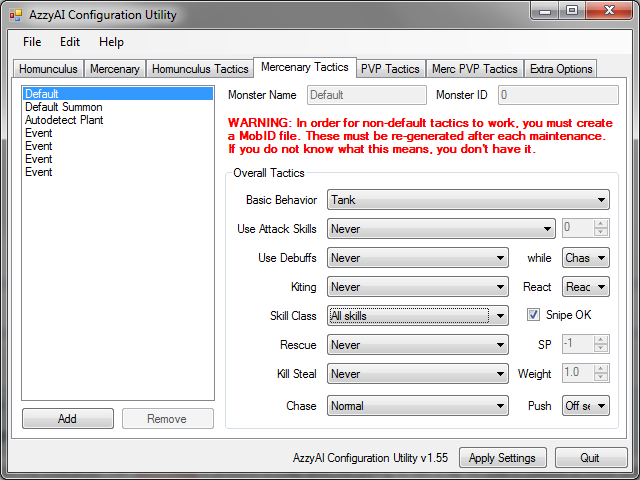 Maybe post the contents of or upload the H_Tactics.lua for review. TactLastSavedDate = "Default Tactics 1.54"
"React" means they won't be attacked unless they attack you first, and those mobs normally don't attack you first. Edited by renouille, 14 May 2016 - 07:18 PM. ** Apparently using the AzzyAI configuration tool wasn't changing my settings. I changed them manually and now it works. Edited by Kasumidoll, 14 May 2016 - 07:44 PM. I want to thank you for your AI. I was an european player in official europe server and that AI helped me a lot. Now I quitted from there because population is almost dead and joined to IRO. Btw: Is there any cooldown for amistr bulvark? I mean after casting bulvark players can cast also pyroclastic or granictic armor? Is it available in this server? or its like other servers? Edited by burcoker, 01 June 2016 - 09:36 AM. Hey azzy, first I want to thank you for the best AI of the game. I m playing iPlayRO and using a vanilmirth, and the vanilmirth is not attacking at all. This is what I m getting. ./AI/USER_AI/AzzyUtil.lua:744: bad argument #2 to 'GetV' (number expected, got nil). The situation is that I'm in Nifflheim town with my Homunculus out (set to Ignore in Default tactics, since I don't want my homu attacking monsters), and any time I or it is approached by a monster (Gibbet, Quve, etc), the error pops up. Pretty much freezes my client until I hit OK on the dialog, and will happen with every monster swing. This issue suddenly started happening to me a while ago, out of the blue without changing any settings. What's the cause of it? I have one problem with attack speed in 1.551 version. its very low........ can correct? And sorry my language, my english is very poor. hello,, Good day by the way..
guys i have a problem in my game... i going to job change to a ranger but in the last of the 3 exams where i have to use my companion the baby wolf.... after i double click it ... my game crashed!! Guys I’m Sorry if this is not the topic but please help!!! Kudos to all help I can get thank you…..
for that ranger quest, im just use to download the new Ai and replace. After that, no problem and can complete the quest. Try it!